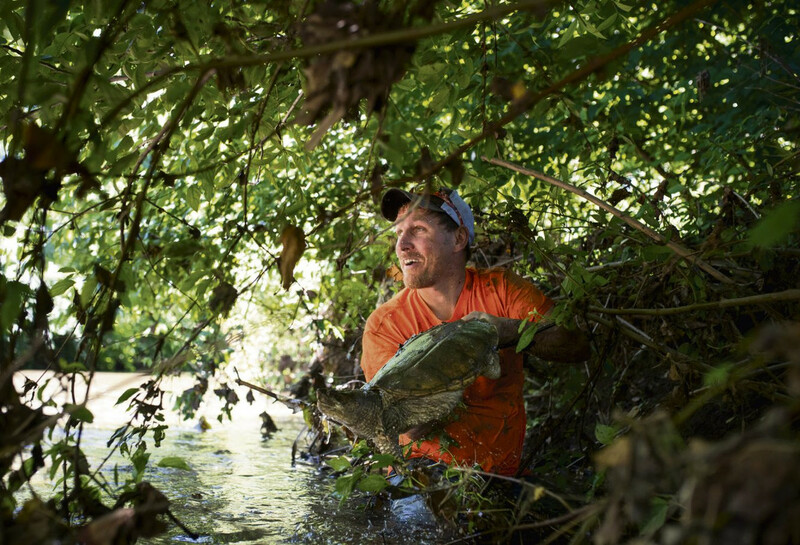 Joey Clemens, of Murrysville, holds a snapping turtle, which is around 30 pounds, that he pulled out Brush Creek in Penn with his hands from under tree the bank on July 7, 2018. It’s not the kind of hobby just anyone would consider. It’s not the kind of family tradition that many would put into place and then pass on. But when the Clemens boys of North Huntingdon head to local creeks, it’s for the thrill of a unique hunt … and the catch … and the release. They’re pursuing snapping turtles, whether it’s Sewickley Creek in Sewickley Township or Brush Creek in Penn. In Pennsylvania, a permit is required to hunt, take, catch or kill common snapping turtles for the purpose of sale, barter or trade, according to the state’s fishing laws and regulations. The Fish and Boat Commission encourages catch-and-release. Snapping turtle season runs from July 1 through Oct. 31. Al Clemens was but a teen in the 1940s when the whipper snapper started snappin’ back. He knew that deep in the holes in the mud and camouflaged in the tangled roots of creekside trees lived snapping turtles. Al, now 85, does not walk through the creeks anymore, but four generations of the Clemens family still do. Joe Clemens, who hunts the most, says he learned from his dad, Big Al, who was known in the area as the turtle man. Big Al hunted until he died in 2011. “I still do it because it makes me feel close with my dad,” Joe said. Family members do not use lures or hooks. In fact, they oppose that practice. “I’ve seen turtles with huge hooks stuck in their necks for the rest of their lives. If you capture them for food, then it’s fine, but don’t catch and release and not take the hooks out,” said Joey Clemens. Oh, sure, there is the occasional turtle soup on the Clemens’ table, but that’s not the motivation. Vince Clemens and his son, Adyn Clemens, of North Huntingdon, walk through the brush to get to Brush Creek in Penn, where they hunt for snapping turtles on July 7, 2018. 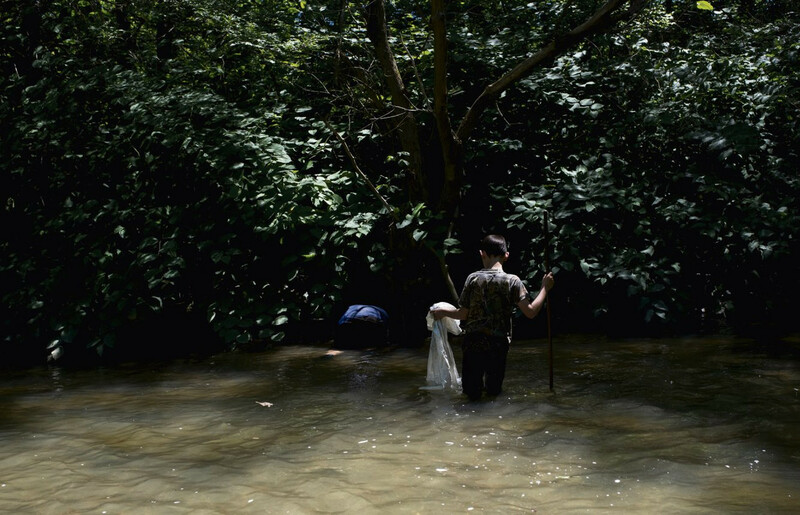 Adyn Clemens, of North Huntingdon, watches as John Clemens, of Irwin, looks under the brush and tree root for snapping turtles on July 7, 2018, in Sewickley Creek in Sewickley Township. Vince, Joe and John Clemens reach into the the roots of a fallen tree in an attempt to catch a snapping turtle on July 7, 2018, in Brush Creek in Penn. 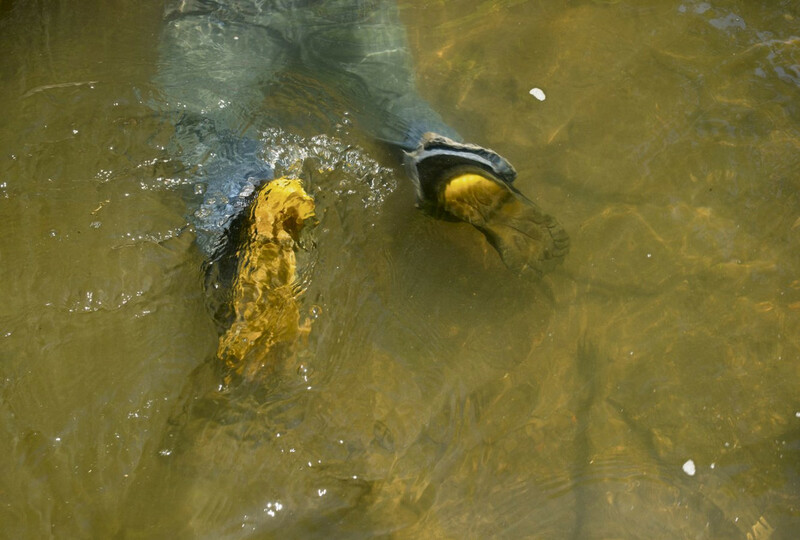 Joe Clemens’ legs float in Sewickley Creek in Sewickley Township on July 7, 2018, as he reaches into a hole where he thinks a snapping turtle is. Joey Clemens, of Murrysville, reaches into a hole under tree roots as he hunts for snapping turtles on July 7, 2018, in Brush Creek in Penn. Joey Clemens, of Murrysville, grabs the roots of a tree he is searching under for snapping turtles on July 7, 2018, in Brush Creek in Penn. Joe Clemens, of Irwin, pulls out a snapping turtle from under the brush on July 7, 2018, in Sewickley Creek in Sewickley Township. 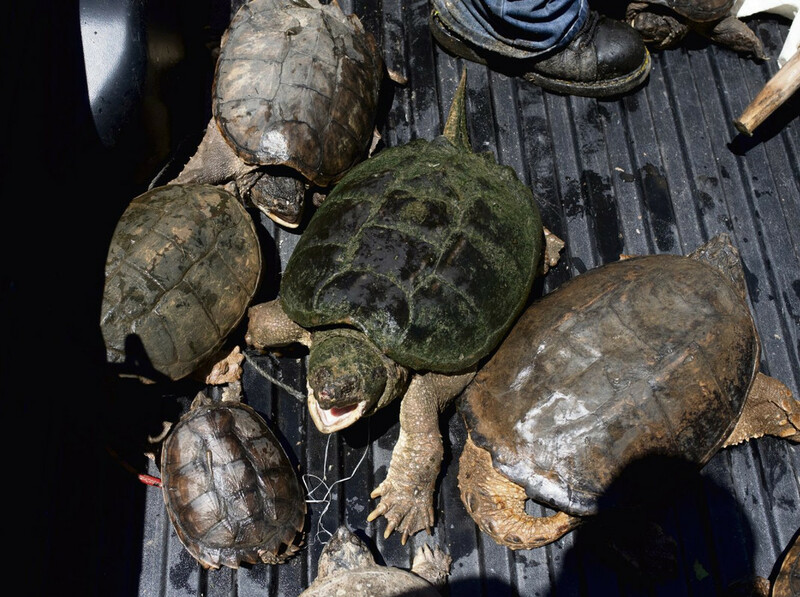 Snapping turtles hiss in the back of Joe Clemens’ truck on July 7, 2018. The Clemens family normally releases the turtles back into the creek after taking photos with them. 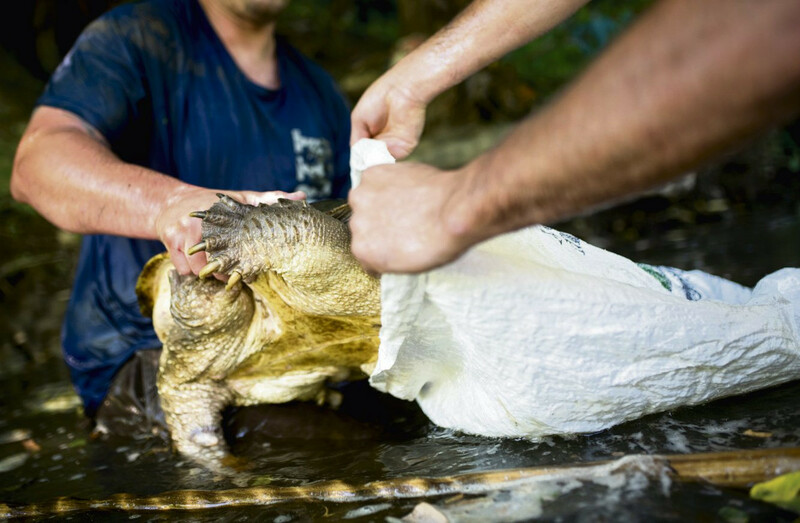 Joe Clemens, of Irwin, holds open a bag to put the snapping turtle in while the family hunts for more turtles on July 7, 2018, in Brush Creek in Penn. 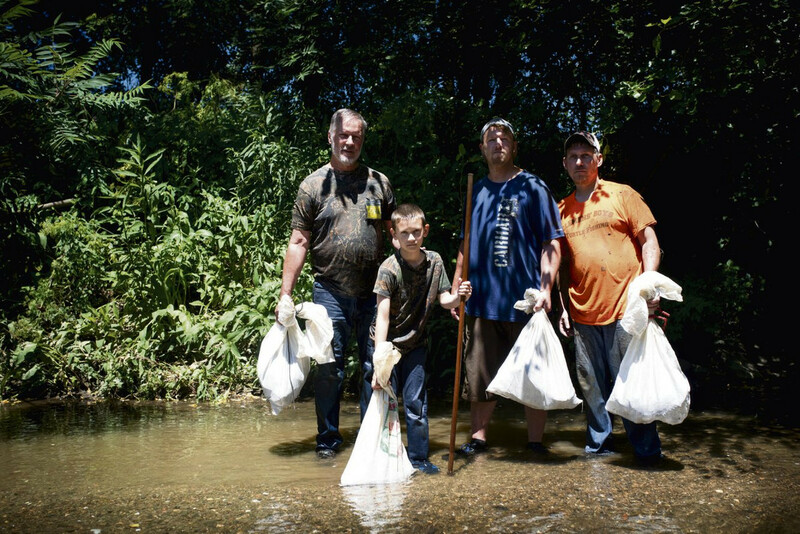 Vince, Adyn, Joey and Joe Clemens pose for a portrait on July 7, 2018, with sacks full of snapping turtles before they get out of Sewickley Creek in Sewickley Township.